In a spicy and sweet sequel to her best-selling book, The Cajun Cornbread Boy, author Dianne de Las Casas brings to life a new friend for the Cornbread Boy—the sticky sweet Buttermilk Biscuit Girl. Rascally raccoons, feisty foxes, and artful alligators aren’t the only creatures running wild in the bayou. 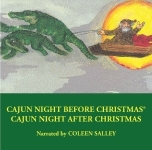 With a peppercorn nose, a boudin mouth, chili-pepper eyes, and no small amount of cayenne pepper, the Cajun cornbread boy sprints through the swamps in shrimp boots and a cast-iron skillet hat, shouting as he dodges a number of perils along his way. When the boy meets an alligator who’d really like to have him for lunch, one of them is in for a truly spicy surprise! 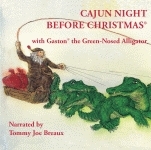 Drawing on the rich oral tradition of the Cajun people, Cajun Folktales collects six of the best children’s stories that have been passed down from generation to generation. Told in the tradition of Brer Rabbit, these stories are accompanied by the beautiful illustrations of Patrick Soper. Hardcover.